This recipe is what I call a “sitter” because I’ve been sitting on it for quite some time. I’ve made it countless times but every time I do, everyone is so busy enjoying it that I never get the chance to take a photo. And when I say “everyone,” I mean everyone except David (he who is still learning to love zucchini,) but that’s OK because that means there is just more for me. I remember when I was little, we lived in a block of flats and had the most lovely neighbours. Mary was a great cook and in fact, her Baked Cheesecake recipe is one of my all time favourites. Her family was vegetarian which seemed almost exotic back in the seventies and I remember it was at her place that I first tried zucchini, although in England we called it (and still call it) a courgette. I was never a massive fan of zucchini as a kid but have really taken to it as an adult. I just can’t get enough. I am always grateful to Mary for that early zucchini exposure and I’m sure she’d give this dish her seal of approval. This dish isn’t just for the zucchini lovers though. 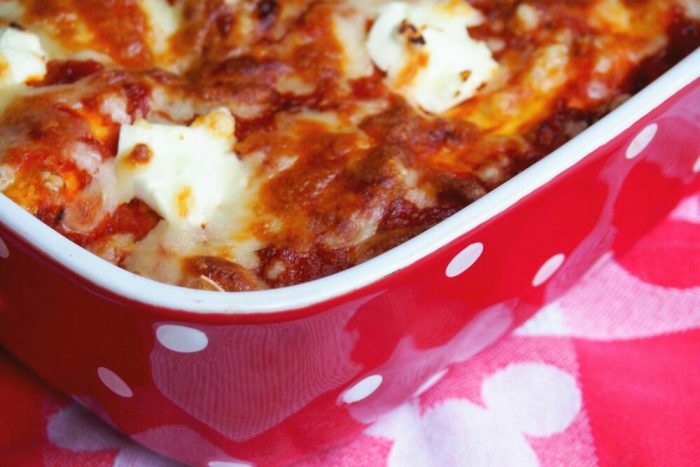 This will appeal to those like me, who have graduated from The Lazy Girl School of Cooking because this lasagne is quick, easy and relatively healthy compared to other lasagne recipes, because it’s packed with veggies, requires relatively little pasta and there’s no creamy sauce. In fact, I usually make it with low fat quark and it’s hands down delicious. Best of all, left overs taste great the next day and it’s delicious hot or cold. I like to use my own Tomato Pasta Sauce for value added goodness but shop bought would work just as well. So tell me, is there a food that you learned to love as an adult? Did you “graduate” fromThe Lazy Girl School of Cooking too? Heat oven to 220C/200C fan forced. Heat the oil in a large frying pan and fry the onion on a gentle heat for about 3 minutes. Add the zucchini and the garlic and fry until the zucchini has softened and turned bright green. Stir in 2/3 of the quark and the cheddar, then season to taste. Heat the tomato sauce in the microwave or on the stove. 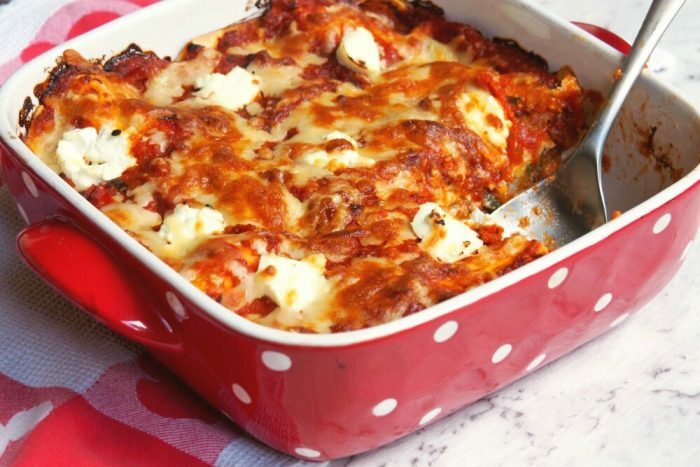 In a deep 20cm x 20cm baking dish, layer up the lasagne, starting with half the cheesy zucchini mix, then lasagne sheets, then tomato sauce. Repeat, and top with blobs of the remaining quark, then sprinkle over the rest of the cheddar and all the pizza cheese. 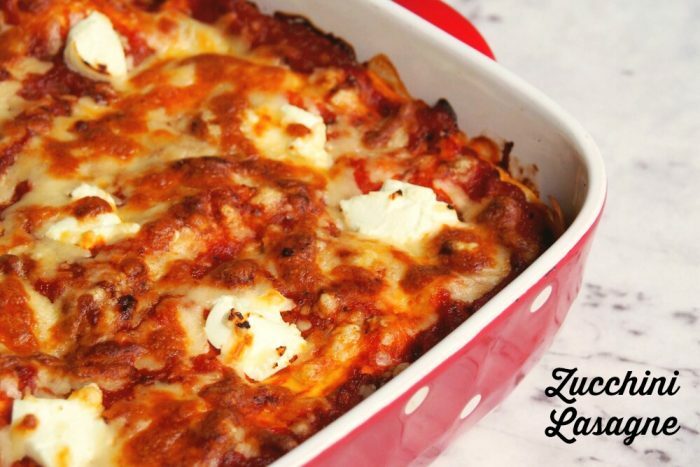 Bake for about 15 minutes until the pasta is tender and the cheese is golden.